Teenage Mutant Ninja Turtles Season Four is finally here on DVD for the first time! The box this set comes in is pretty nice. The front cover has a three dimensional image of Raphael, and I mean for real, not an optical illusion. Raphael's face actually protrudes out of the front of the case. To protect this, the case is enclosed in a clear rectangular plastic shell (no pun intended). This clear plastic container has a fold-in flap at the top, so after you remove the clear plastic wrap that surrounds the clear plastic shell, and then remove the actually DVD case, it can then be put back into the clear plastic shell for storage. So it's not one of those plastic containers that requires a chain saw and blowtorch to open. Pretty nice! Done? Okay, then back to the review. These episodes are pretty much on par with those season 3 episodes, which are all a far cry from the awesome season 1 episodes. These seasons all just ended up becoming 100% comical, ditching the stealth and other ninja action aspects pretty much altogether. And by comical, I mean like goofy-comical or kiddy-comical, not clever or witty. Definitely not writing that was intended for mature audiences. They might have well renamed the series to Teenage Mutant Goofy Turtles. I understand how parents don't want to see ninjas doing real ninja things, such as injuring people with weapons, but seriously, how many times can you use a sword to flip something in the air and swing at it so that it hits a bad guy in the head? I still have a hard time believing that I actually used to be obsessed with this show. But hey, it was really made for kids, and kids definitely love it (I sure did, and so did most of my friends). So if you have kids, this would actually be a good set to pick up since it contains over 15 hours of programming and at a pretty good price. 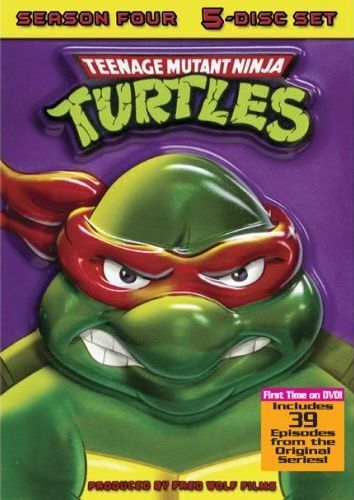 Teenage Mutant Ninja Turtles Season Four was released by Lions Gate on DVD starting March 13, 2007.